Good morning! It's Sunday and my first thought today was, "Yay! I get to go work in my classroom tomorrow!" Is something wrong with me? It's summer. I love summer. I love my summer break. But I also love the unobstructed time to just work in my classroom. No kids. No deadlines (well, not of the impending doom kind). Just the time to work. And prep. And plan. And bring all of those ideas and inspirations into reality. Please tell me I am not the only one out there that feels this way. So many of my team and staff are the, "They're not paying me, and, therefore, I am not going in until the last possible moment" variety. I am more of the "I need to organize and get ready to maintain my sanity" variety. Because we all know that the moment school starts, we're behind. And you never catch up. As hard as you try. It's impossible. Enough school talk. On to the card. 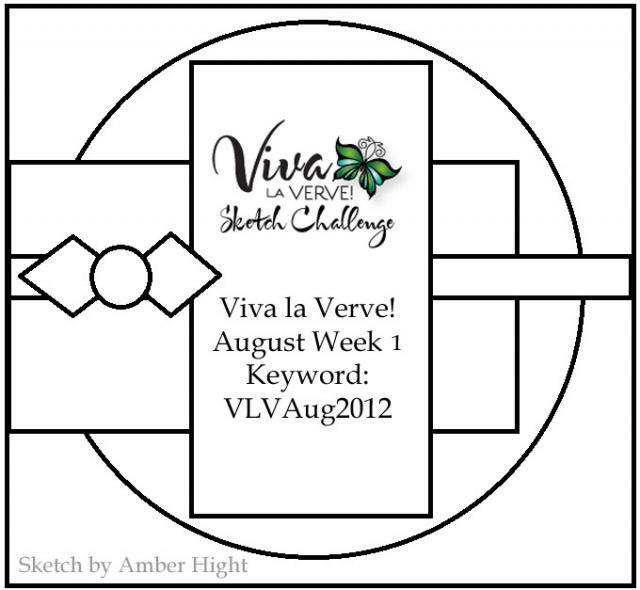 I played along with this week's Viva la Verve sketch. It's the first of the new month. And I am determined, DETERMINED to finish the whole month's worth of sketches. It's a bit on the sad side that I cannot remember the last time I finished all four or five sketches in the month. I used to never miss one. Why does life get in the way of stamping?! As for the card, I pulled out my new MME dp once more, along with a doily (I always forget to use these things! ), and then through in some matching brads at the last minute. Enjoy your Sunday! And thanks for stopping by! I'm going to be humming tht song all day now :) Great take on the sketch and love the colour combo. you are right on track with the sketches this month! 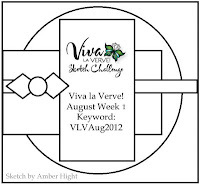 It would be fantastic to win a $100 GC as the new realease is crazy fabulous! I understand where you are coming from with your classroom. I go in the week before to set up and reflect on what my main focus will be...we are on salary up here and I always think I just work until my job is done (which is never! LOL). I also brough a box of things to look over and read this summer...hmm, better start that! Gorgeous card! LOVE the doily :) Hugs to you and your wild enthusiasm for our profession! Woohoo! Simply gorgeous! Love that verse and the beautiful ribbon.